Wabash National raised a red flag about its third-quarter results, and investors took it as a sign to sell. But most of its current problems aren't all that troubling. Though the trucking industry is in the midst of an incredible surge in demand, that hasn't translated into massive gains for trailer manufacturer Wabash National Corp. (NYSE:WNC). Quite the opposite, really: Last month, the company warned investors that its third-quarter numbers would come in lower than originally anticipated. So far this year, Wabash's stock price is down 27%. Given the trucking industry's boom, it seems strange that Wabash's business is suffering as much as it is. 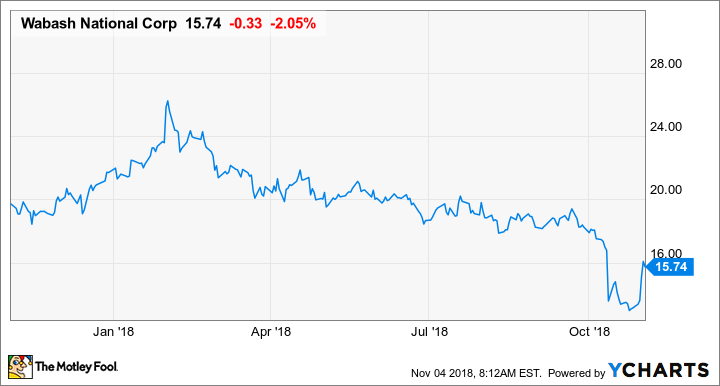 So let's take the pulse of this company, sort through the Q3 earnings results it delivered on Oct. 30, and look for an explanations as to why it hasn't been able to fully capitalize on what should be a favorable environment. Then, we can attempt to gauge whether its share price decline was merited. DATA SOURCE: WABASH NATIONAL EARNINGS RELEASE. EPS = EARNINGS PER SHARE. Customers were unable to pick up new units because their trucks were too busy. Higher commodity costs ate into margins. Data source: Wabash National. Chart by author. Despite all this, Wabash National has some positive things to say about its Q3. It brought in the second-highest quarterly revenue in company history, and customers signed up for orders at a staggering rate, boosting its backlog by 80% to $1.3 billion. It's pretty clear that one of Wabash's core issues is that demand for its products is so high that neither its suppliers nor its customers can keep up. Of all the problems a company could have, that isn't the worst. In the press release accompanying the Q3 report, CEO Brent Yeagy highlighted the boom in sales, as well as some of the steps the company is taking to address its most concerning issue -- higher costs for its inputs due to tariffs. Yeagy seems to think that even though this quarter's results came in well below expectations, the company will be able to make up for that in the fourth quarter. Overall, the continued strong market demand has driven our backlog to a new record level of $1.3 billion, an increase of 80 percent compared to the prior year quarter. Trailer and truck body demand has remained strong continuing the trend from the previous quarters and supporting our belief in the growing secular demand in e-commerce and home delivery. We continue to take steps to reduce the margin impact of U.S. tariff policy, raw material inflation, supply base disruptions and a very tight labor market on our business for the remainder of 2018 and into 2019. Looking forward, we expect sequential improvement in the fourth quarter operating results as we manage the various challenges impacting our business, and as the core trailer business expects stronger pricing and a more favorable sales mix. As a result, we are maintaining our full-year guidance for 2018 new trailer shipments to 60,000 to 62,000 units and GAAP and non-GAAP earnings of $1.41 to $1.46 per diluted share and $1.50 to $1.55 per diluted share, respectively. Shareholders never want to see a company issue a profit warning, but the problems that Wabash encountered in Q3 that led to one were mostly good problems to have. Demand is high, and the company's results suffered largely because customers were unable to take delivery on time, and suppliers were unable to deliver components fast enough to meet its needs. If I'm on a management team, I would much rather my company be dealing with the issues of being too busy than not busy enough. The one real concern investors should focus on is the rise in commodity costs due to tariffs. Wabash takes orders for products a couple of quarters in advance; when the costs of materials increase after it books those orders, it can eat into margins. As Yeagy noted, though, the company is working on passing along its rising costs to customers. So as bad as Wabash's profit warning sounded at the time, the stock drop hardly seemed warranted. There are still a lot of tailwinds for the trucking industry right now, thanks to the strong overall economic, and the growth of e-commerce both in volume and diversity of products offered. If management can solve its production and delivery bottlenecks, then Wabash's stock could turn out to have been a pretty attractive deal at current prices.